Given the iPhone’s history – from the 3G onwards, there’s always been a half-step S model before the next numbered iPhone – so it was no surprise the 5S was first and so we’re looking at 2014 for a new iPhone 6. One thing is for sure, with potential refreshes of such super handsets as the Samsung Galaxy S4, Sony Xperia Z and HTC One, the next iPhone will have to seriously up its game. 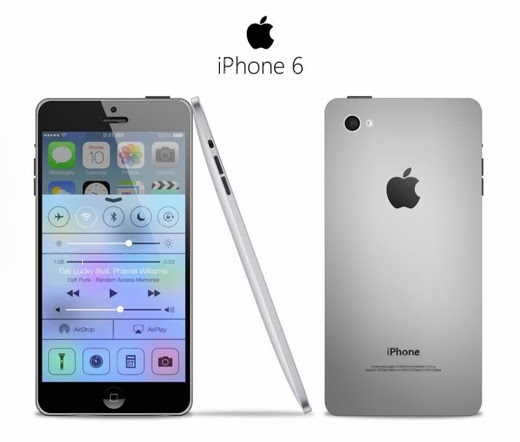 Will iPhone6 increase the view of the person? The iPhone 6 release date will be in 2014. It will follow the iPhone 5S which will be released at the end of this week..
Jefferies analyst Peter Misek says that there will be a June 2014 release for the iPhone 6. We reckon it will be later than that, around a year after the 5S. Citi’s Glen Yeung also believes that we won’t see an iPhone 6 until 2014, although that’s no big leap. Interestingly, in May 2013 Stuff reported it received a photo of the till system at a Vodafone UK store (which it has since removed along with the reference to Vodafone), with ‘4G iPhone 6’ listed. So could we see both an iPhone 5S and iPhone 6 in quick succession?Some reports suggest a new 5S in the late part of the year before a revamped iPhone 6 very early in 2014. It’s been suggested that there could even be three size variants of the new iPhone – check out these mocked up images by artist Peter Zigich. He calls the handsets iPhone 6 Mini, iPhone 6 & iPhone 6 XL (these look rather like the iPhone 5C variant though). However, as ZDNet rightly points out, different size variants aren’t exactly easy to just magic out of thin air. About time too. Well, that’s what iDownloadblog reckons, quoting Jefferies analyst Peter Misek. Many Android phones now boast NFC and Apple appears to have been happy to be left behind here. We’d expect a September or October release date for iOS 8 in line with previous releases. what do you think of iOS7? We’ve already seen a 128GB iPad, so why not a 128GB iPhone 6? Yes, it’ll cost a fortune, but high-spending early adopters love this stuff. According to Business Insider, of the many iPhone 6 prototypes Apple has made, one has a giant Retina+ IGZO display and a “new form factor with no home button. Gesture control is also possibly included”. It will surely include Apple’s new Touch ID finger print tech though? The Retina+ Sharp IGZO display, would have a 1080p Full HD resolution. It’s also been widely reported that Apple could introduce two handset sizes as it seeks to compete with the plethora of Android devices now on the market. Take this one with a pinch of salt, because China Times isn’t always right: it reckons the codename iPhone Math, which may be a mistranslation of iPhone+, will have a 4.8-inch display. The same report suggests that Apple will release multiple handsets throughout the year over and above the iPhone 5S and 6, which seems a bit far-fetched to us. Jefferies analyst Peter Misek also says he believes the new iPhone will have a bigger screen. Different sizes also seem rather likely to us – the word on the street after WWDC 2013 was that there would be 4.7 and 5.7-inch versions. More rumors in September 2013 point to a six-inch display, but this seems a little large to us. Apple’s bought camera sensors from Sony before, and this year we’re going to see a new, 13-megapixel sensor that takes up less room without compromising image quality. An Apple patent, uncovered by Apple Insider in May 2013, shows a system where an iPhone can remotely control other illuminating devices – extra flashes. It would work in a similar manner to that seen in professional photography studios. Interesting stuff. GT Advanced Technologies provides crystal grow equipment and materials for consumer electronics, among other industries and has announced that it’s signed a multi-year supply agreement with Apple to provide sapphire materials. Sapphire has figured prominently in recent Apple products – the iPhone 5S’ Touch ID fingerprint reader features a cut sapphire crystal cover and the iPhone 5 was the first to feature a sapphire crystal lens.So what will we see in the iPhone 6? Certainly the Touch ID fingerprint reader, but also other scratch-proof materials. GT says it will own and operate the machinery to produce this stuff at a new Apple plant in Arizona. One thing seems certain – Apple can’t ignore the massive movement towards eye-tracking tech from other vendors, especially Samsung. It seems a shoe-in that Apple will deliver some kind of motion tech within the next iPhone, probably from uMoove. And could the iPhone 6 really have 3D? It’s unlikely, but the rumours keep on coming.